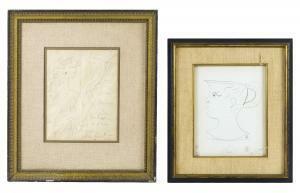 Find artworks, auction results, sale prices and pictures of Jean Cocteau at auctions worldwide. Jean Cocteau French Cubist Ink on Paper Ink on paper. Featuring portrait of a woman with fish and fork. 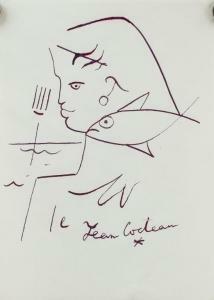 Signed Jean Cocteau (French, 1889-1963) on the lower edge. 23.5 x 17 cm (9..3 x 6.7 inches). PROVENANCE: Upper New York estate Jean Cocteau (1889-1963) was an enormously influential French artist and writer known as one of the major figures of Dada and Surrealism. With an oeuvre that spanned painting, novels, poetry, plays, and films, Cocteau established himself as a leading creative force in Paris. A regular member of the avant-garde, he maintained long-term friendships with artists such as Pablo Picasso, Tristan Tzara, Francis Picabia, and Man Ray. \“The job of the poet (a job which can't be learned) consists of placing those objects of the visible world which have become invisible due to the glue of habit, in an unusual position which strikes the soul and gives them a tragic force,\” he once mused. Born on July 5, 1889 in Maisons-Laffitte, France, the self-taught Cocteau would regularly draw his friends and acquaintances in a distinctive, fluid style informed by his interests in Cubism, psychoanalysis, and Catholicism. \“Poets don't draw,\” he once quipped about his artworks. \“They unravel their handwriting and then tie it up again, but differently.\” Among his best-known works is the novel Les Enfants Terribles (1929) and his critically acclaimed films le Sang d\’un poète (Blood of a Poet) (1930), La Belle et la Bête (Beauty and the Beast) (1946), and Orphée (Orpheus) (1949). Cocteau died on October 11, 1963 at the age of 74 in Milly-la-Foret, France. Today, his works are included in the collections of The Museum of Modern Art in New York, the National Gallery of Art in Washington, D.C., and the Courtauld Institute of Art in London, among others. 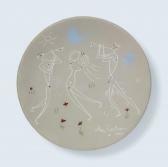 JEAN MAURICE EUGENE CLEMENT COCTEAU France/Belgium, 1889-1963 Two figural sketches: 1) Hommage a Emile Verhaeren ...". 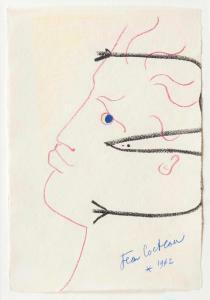 Signed and dated lower right "Jean Cocteau 1955". Pencil on paper, 10" x 8". Framed 19" x 17". 2) A head-shaped handled vessel. 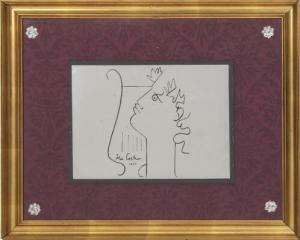 Signed lower right "Jean Cocteau". Italian inscription verso dated 28/7/58. Crayon on paper, 11" x 9". Framed 16" x 14"." Condition 1) creased from being folded into quarters, small pinhole. stain. 2). Undamaged.